Tired of waking up to your clock radio? Well, you can use your Mac as an alarm clock, and have it play an iTunes playlist, so you wake up with the right music every day. All you need to do is use a few built-in Mac OS X tools: Automator, the Energy Saver preference pane, and iTunes. Click Finder in the Library column, then drag Launch Application from the Action column to the workflow area at the right of the window. Select iTunes from the application popup menu. 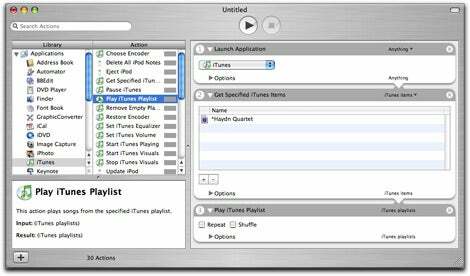 Click iTunes in the Library, then drag the Get Specified iTunes Items action to the workflow area below the first action. Click the plus (+) button and select a playlist. With iTunes still selected in the Library, drag Play iTunes Playlist to the bottom of the workflow area. Save this workflow as an application, with any name you want. Open the Accounts preference pane in System Preferences, click the Login Items tab, and drag your workflow to the login items list. Now, open the Energy Saver preference pane, click the Schedule button, and choose the time to wake up your Mac. When it wakes up, the Automator workflow will run, telling your Mac to play the selected iTunes playlist. Make sure you don’t have any speakers plugged into your Mac—if they are not on, you won’t hear anything, and there’s no point in leaving your speakers on all night. Your internal speakers—even on a laptop—will be fine for this early-morning serenade.